ArtiSign Sign Co. | Banners, Signs and more. High quality. Fast turnaround. Looking for something else? Click here to tell us about your project. ArtiSign makes a wide range of high quality sign products, and we have over 18 years of sign-making experience. ArtiSign is known for crushing deadlines without sacrificing quality. Click here to see what our clients have to say. ArtiSign focuses on all aspects of wide format printing, full-color banners, yard signs, decals, storefront graphics, trade show displays, vehicle wraps, engraving and so much more. Click here to view our photo gallery. Tell us about your project. Send us an email or call us at 405-564-0515. Crushing deadlines for over 19 years. That’s ArtiSign. High quality materials and inks ensure quick turnaround and consistent output. I worked with Mike on a small sign and had the finished product within a couple of hours after I made initial contact. He stayed in contact through the entire process. This is a great company to work with. The next time I am in the area and need a sign I will call Mike. We worked with Mike at Artisign to get a bunch of sinage done, for a chemical engineering regional student conference at OSU. At first, we didn't know exactly what we wanted. But, after about a half an hour of talking with Mike, I learned of multiple sinage solutions and exactly how I could submit our artwork so that the final results would be clean. Since our event was sponsored by multiple companies, and we needed massive banners with their logos on it, a major concern was to ensure fine-detail and to avoid pixel visibility (which you see in low-resolution images). Since I had some photoshop experience, Mike took the time to show me how the artwork was formatted before printing in Adobe Photoshop/Illustrator so I knew exactly what to do our our end, which potentially saved us a lot of money on graphic design. We ended up buying a 8x3ft banner, (2) ~7ft vertical retractable banners, and (10) corregated plastic yard signs. The resulting products were excellent and we received a lot of positive feedback. Mike at Artisign was truly a pleasure to work with, he went above and beyond to help us take our ideas and turn them into tangible products. Mike has printer thousands of yard signs for RSI over the years and several banners, I would highly recommend ArtiSign for all your signage. If I could rate higher than a 5 star, I would! On multiple occasions, Mike has provided our company with fast / accurate service, at more-than-fair price AND excellent quality to boot! His attention to detail, customer care and follow up is impeccable. I will 100% GLADLY refer him and his printing services. Thank you Mike! I work as the administrative support for a local rural law enforcement agency and we needed a sign for our new police station that is currently being built. I can’t say enough for how great Mike was to work with; he understood our goals regarding how we wanted the sign to look, as well as the durable material with which the sign needed to be constructed with. He was professional, timely with his responses, and ultimately, we were extremely happy with the end product. 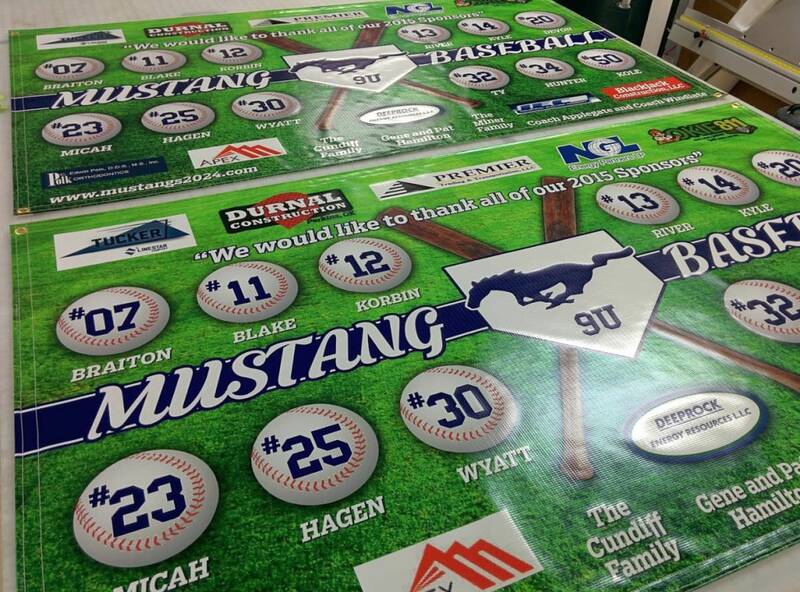 Definitely recommend ArtiSign as a great vendor and if the need arises, we will definitely seek his services again! The service I received at Artisign was fast, professional, and very high quality. Mike was very helpful and patience as I fumbled thru technical errors on my part, he made sure that I was going to get the absolute best quality banner for my business. His responses when I had questions were very quick and helpful. He worked with me back and forth for almost a week to meet all my needs. The price is very reasonable and the quality of my banner is everything I'd hoped for. I will go no where else for my sign and banner needs. In the marketing profession, I don't always have preferred notice on projects but the few times that I have reached out to Mike with an order that needs to be processed in crunch-time, he always takes care of me with 5-star priority service. I appreciate the quick turnaround time as well as the friendly customer service Thank you! One of the best businesses in town! After submitting my order, I got my banner printed and delivered within 6 hours on the same day. 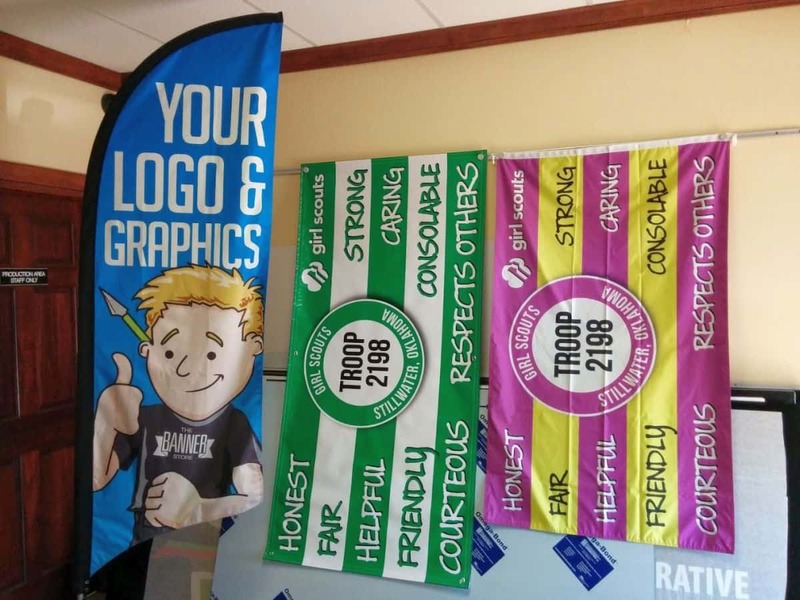 The quality of the banner and service is great. Mike went above and beyond to ensure the project was exactly how I wanted. Mike did an amazing job on our baseball banner. Super fast and great customer service! Highly recommend Artisign! I had a great experience with this shop. We had last minute project and everything got done on time. The communication was great, and the artwork turn out really nice. Highly recommend!! These guys do fantastic work - color and emblem match was incredible! Fast - - less than 24 hours after we approved! And, economical but don't do 'cheap work'! They are the most quality-minded vendor I've dealt with in a long time! They're particularly good a finding and adapting Greek letters, which makes them a natural choice for the greater Greek community at Stillwater. I was very leery about going with a "run of the mill" outfit because I had a tight timeframe and needed a great yard-sign result. Mike (the owner) is fantastic and worked with me beyond anything I expected. He helped me with the file and that ensured the result was spectacular. He also gave me a super-fast turnaround and a better price than all the businesses that claim they're the cheapest until you pay almost as much for shipping. Now we're working on car magnets. Will NEVER GO ANYWHERE ELSE! Got a question about your sign project? Send us an email with your project details. We reply to most emails within 30 minutes! You're welcome to send us an email from a Yahoo email account, but we can't guarantee that our email reply will make it back to your inbox. Yahoo has very strict incoming email delivery rules and filters. About one third of all emails we send to Yahoo accounts get blocked or end up in the spam folder. We recommend that you whitelist our domain in your Yahoo email account by creating a Yahoo Mail filter. Whitelisting is easy. 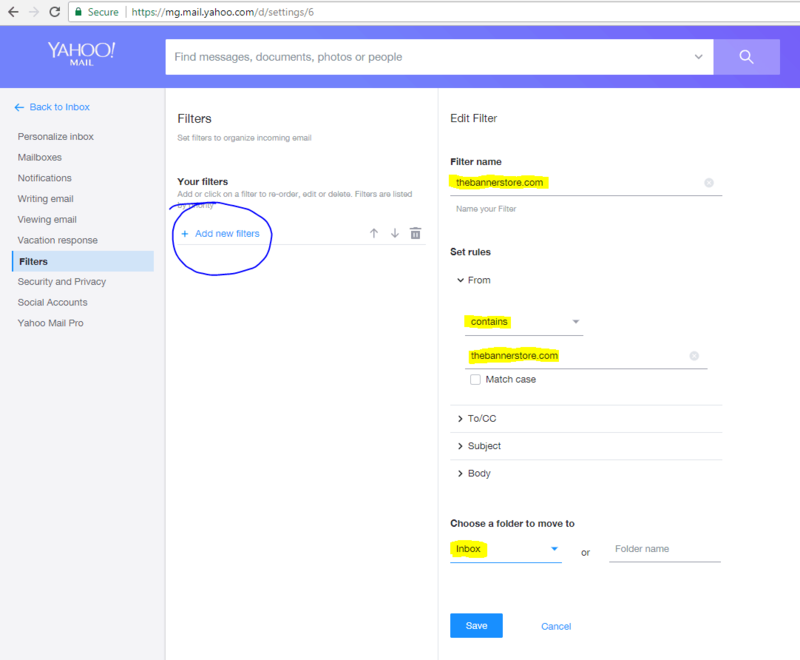 Just log into Yahoo Mail, go to Settings > More Settings > Filters and create a "New Filter" for thebannerstore.com. Here's a screenshot of what the email filter should look like: screenshot. Click "Save" and that's it! Note: Whitelisting doesn't guarantee that our email will get to you, but it greatly improves the chances. If you don't receive a response from us within 24 hours, please call us at 405-564-0515.